New Balance's marketing pitch: The support you need and the lightweight construction you demand. Outsole: Hard carbon rubber in heel, softer blown rubber under mid and forefoot. Widths available: D-standard (reviewed), 2E-wide. The brand new 1500 v1 complements the 1600, 1400 and the Zante (somewhat). The New Balance 1500 v1 is a brand new intro this year, offered as a lightweight trainer with a medium heel to toe drop of 6 mm. We haven’t tested the MR1400 V2 and the 1600 V2 (yes, we know, a bit of catching up to do), but based on appearances alone, the 1500 v1 seems to be positioned as a more cushioned and ‘conventional’ version of the 1400, a shoe which happens to be much lighter and race focused. That said, it’s always hard to place these models in clearly marked slots. For example, the 1400 V2 might be lighter than the 1500, yet comes with a 10mm drop. The 6 mm drop 1500 v1 features a harder medial post in its low profile midsole, which sets it apart from the 1400 and most lightweight (neutral) speedsters. A lightweight runner with a medial post is not a sight you see everyday, and puts the 1500 in rare company. A quick scan of this narrow footwear category will tell you that there isn’t much of a choice when it comes to motion control or support versions. The only other two models we can think of are the Asics DS Trainer 20 and the adidas Tempo 7 Boost, both of which cater to the population of runners seeking medial support. Haven’t reviewed either yet, so we’ll discuss the 1500 v1 in near-isolation. The Zante feels similar in a couple of areas, so at some point today we’ll briefly cover those overlaps. We’ll come straight to the point without a lengthy discourse – we found the 1500 v1 to be excellent.We’re getting increasingly enamored of crossover racers, sub-9 oz. models which fill the gap between traditional trainers and all-business racing flats. So far, we haven’t encountered a dud in this category, from the adidas adios/Boston/Tempo Boost to Nike Zoom streak. Ok, the GoMeb Speed too. There is a clear economy of visual and actual bulk in the 1500 v1’s construction, yet you never get the sense that the shoe is a strip down of materials and features. There is an unmistakable sense of purpose in how the shoe is put together, all the way from the upper to the very outsole nubs. That translates into a finished product which feels just right in most places, be it how the upper fits to the way in which the midsole behaves during transitions. 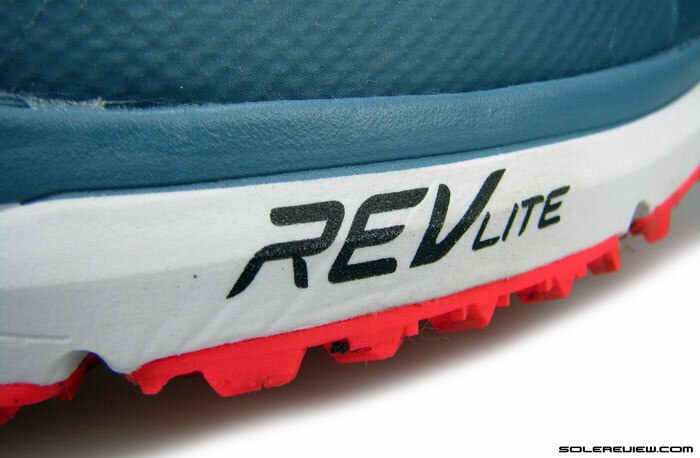 The 1500 v1’s midsole base is ‘Revlite’ EVA, which also does cushioning duties on the 1400 v2. 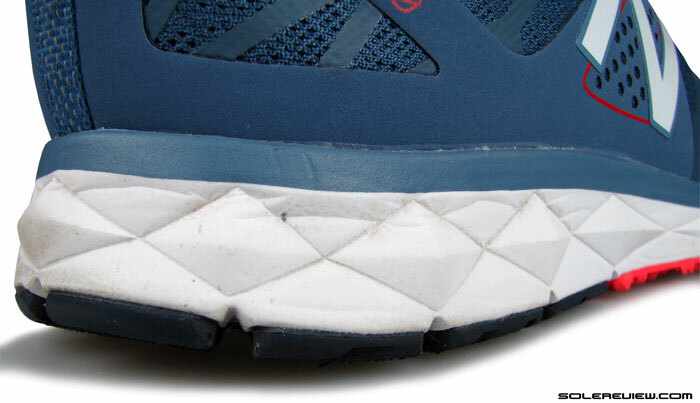 A small, but effective medial post of harder density is part of the midsole. A plastic half-shank, only on the medial side. Midsole combines a single density layer of New Balance’s ‘Revlite’ EVA foam with a small medial post of harder density. A plastic T-beam underlay supports the medial side, just under the firmer density area. The 1500 has a molded and perforated EVA insole which is removable and identical to the one used in Fresh Foam Zante. There’s no board lasting, with the material between the insole and Revlite midsole being soft EVA. Generous application of outsole rubber for a 8 oz shoe. Hard rubber in the rear, soft grippers in the center and front. A wide transition groove splits the lateral and medial halves of the outsole. This splays during weight loading, helping stability and transitions. The shoe might only weigh only 233 grams/ 8 Oz, yet there’s no cutting back on outsole rubber. The geometry is that of a full contact one, hard carbon rubber in the heel in addition to soft blown rubber starting from the midfoot and going all the way till the tip. The medial and lateral outsole halves are separated by a wide longitudinal groove, and branches out into the forefoot flex grooves, which works as well as they look. Flexibility is good on the 1500 v1, but stays in the sweet spot of flex and stiffness. The toe spring is of median height, between the Zante (which has a higher toe spring) and one of New Balance’s neutrals like the 1080 V5. This keeps the last stage of the gait cycle feel smooth and effective. If the 1500 v1 feels similar in some way to the Zante, there’s a good reason: same insole. The amount of heel cushioning did take us by slight (and pleasant) surprise. There is plenty of heel padding, but without too much squish. A part of the 1500 v1’s ride feels like something out of a Zante, and that assumption isn’t entirely misplaced. Both shoes used the same insole and EVA foam strobel, so that’s around 25% sameness right there. 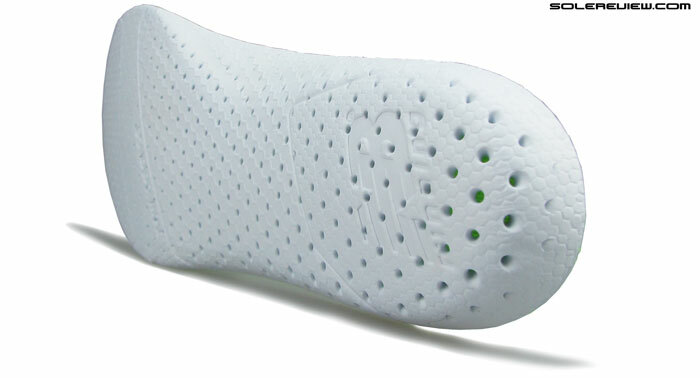 The insole helps maintain a consistent padding feel on top of what is already a smooth ride. 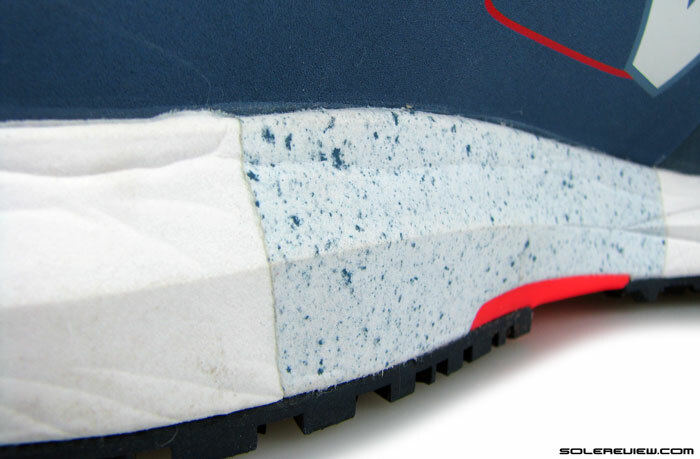 On the arch side of the midsole, the harder density midsole is very noticeable once you start putting some miles on. There’s quite a contrast between the overall midsole softness and the medial post density, so the sensation of a harder material comes through quickly and unfiltered. The medial post gets activated early during the gait cycle; it would be fair to classify the 1500 V1 as a shoe with an early stage motion control character. Whether runners find this to their liking or not depends entirely on individual preferences and needs, and we’re not going to take a stand on that. But most people who’ll buy the 1500 v1 will know what they’re paying for, so it is very likely that the medial post will be appreciated for what it does. What we will point out though, is that the medial post does not feel invasive, neither does it poke underfoot. Unlike the hard rim of something like the Adios Boost, the foot does not load squarely on the edge of 1500 v1’s medial post. 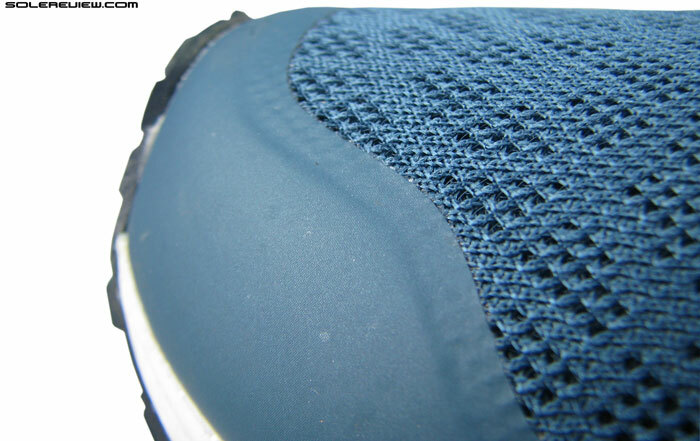 There’s also this layer of foam insole cupping your foot, which blunts the firmness. One thing which we haven’t done is to take the 1500 v1 on a 20 mile+ run, so we can’t say whether the hard medial post will be a bother (or not) during long continuous runs. Till 10 miles, it is a non-issue. 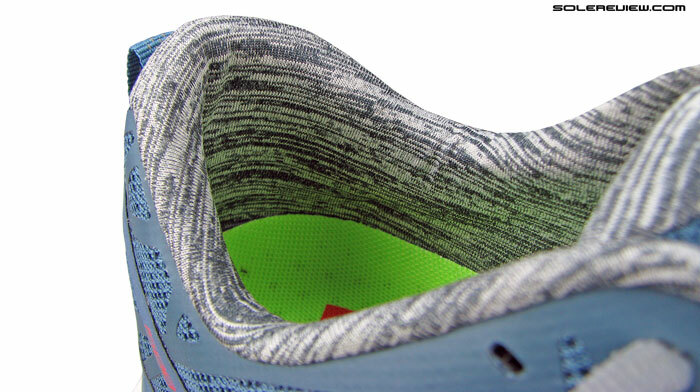 Main midsole body is single density foam with stack heights in the lower range. Stack heights aren’t huge (F 18:R 24 mm approx) here, and the midsole is single density for the most part with a 6 mm drop – so transitions feel great and distraction free. The wide groove which splits the lateral and medial creates a gap running along the centerline, and that helps keep the foot planted and low profile. The medial post occasionally reminds you that the 1500 v1 is a mild motion control shoe, but other than that, there’s no bias or leaning. Yet, we still feel that people seeking a pure ’neutral’ running shoe experience will do well to cross the 1500 off their list and go for single midsole density models instead. 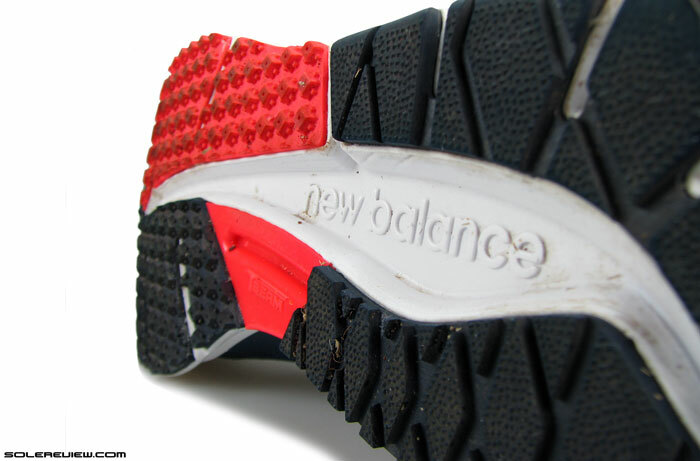 Small race-shoe like outsole lugs grip tenaciously, though a little prone to initial wear. This picture was taken at the 20 mile usage stage. Transitions are assisted by the outsole design, which makes use of flex grooves placed at regular intervals. This articulation smoothens the ride, additionally aided by blown rubber softness. Traction is another plus on the 1500, the small micro outsole lugs providing stellar grip on road and synthetic track. 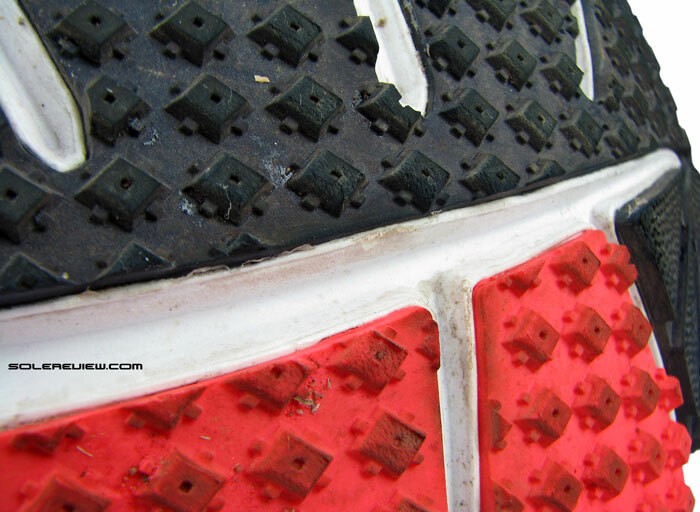 The tips see some degree of wear initially (picture above is after 20 miles), but the level of shredding should tone down once the lug corners are rounded off. The ride has no drama, no fuss, just great for running a variety of workouts, be it shorter 5k bursts or longish 10 mile+ runs. This holds true whether you’re road running or simply making a few quick laps of a 400 meter track; just enough cushioning to take you where you want to go. The 1500 v1 sends up enough ground feedback too, so it’s a win-win. And we’ve just finished talking about the lower part of the 1500 v1, which brings us to the second half of the story. How does the upper do? Everything’s stitched up well together, and the result is a great fit with no complaints. That’s another happy tale. The 1500 upper is a delight with faults being impressively elusive to find. Everything is very well put and finished together, with no excesses or compromises as far as material or features are concerned. It’s not all just form and pleasing aesthetics; the amalgamation of appropriate materials and clever design yields a superior fit experience as well. If there was a time and place to use the term ‘sweet spot’, this is very much it. New Balance’s ‘Fantom Fit’ upper, which adopts a minimal approach to construction. Fused overlays over mesh, no stitching. The 1500 v1 completely eschews the use of stitched-on overlays, and opts for a fused-on Fantom fit design over a breathable and supple mesh base. This helps the 1500 lose a considerable amount of physical bulk without the trade-off of structural integrity. Areas like the toe bumper, midfoot and heel are reinforced with additional components. Internal toe bumper is concealed beneath a welded synthetic overlay. Except for the tip, rest of the forefoot has adequate height. Toe bumper has an internal toe-puff beneath a fused synthetic sheath, which prevents the toe box from collapsing on the forefoot. There is some paucity of space just above the big toe, but rest of the forefoot gets adequate ceiling. Sides are snug fitting, yet can’t be called narrow – and in case you feel that, there always the optional 2E to come to your rescue. The absence of overlays gives the mesh freedom to splay, and not fetter the foot in anyway. We’d categorize the 1500 v1’s fit as being true to size. Eyelets are cut into the main upper and hence do not apply localized pressure. 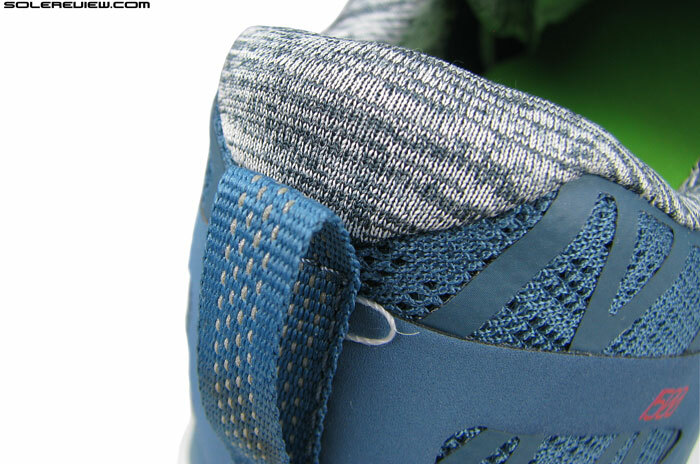 The lacing system is also pretty straight forward. 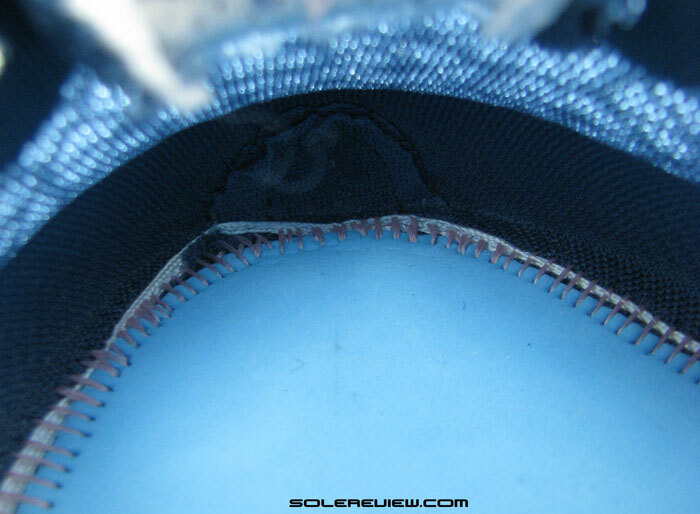 Eyelets are cut into the welded panels, and spacing between lacing rows is uniform. So the pressure spreads evenly over the foot, and you don’t get a localized cinch sensation which is typical of upper designs (not the 1500) using semi-independent eyelets in the midfoot panel. 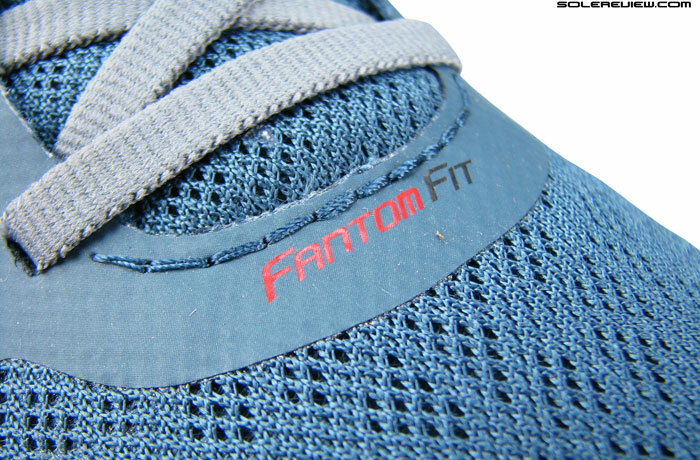 A sieve-like reverse side of the insole, which is also used on FF Zante. No wonder both these shoes feel similar in ride feel. We’re assuming that the Fresh Foam Zante and 1500 v1 share the same last, because both feature identical insoles and last markings. They fit similar except that the use of relatively thick forefoot overlays and independent first row eyelets on the Zante, which increases upper pressure. 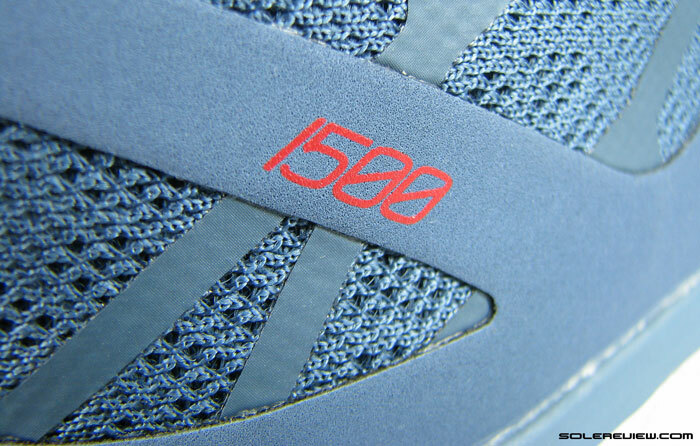 The 1500 v1 feels more relaxed, though the key word to describe the fit quality would be consistency. After running in Mizunos, this medial seam inside seemed like a threat. False alarm, as it turned out to be completely benign. 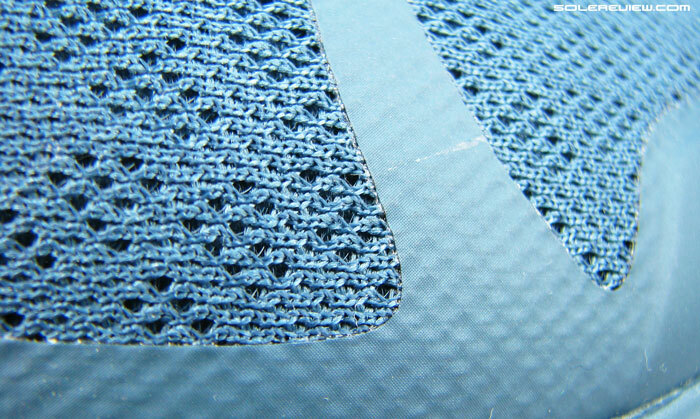 Lower tongue has raw edges( area in white), but no scratching like the adios or Boston – the mesh is soft and accommodating. The upper is well fitting throughout and the interior is bump free. There’s a medial seam inside, and the lower tongue has open edged linings, and we had our apprehensions initially. But that proved to be unfounded. The 1500 feels smooth with or without socks, and no part of the upper irritates or chafes. 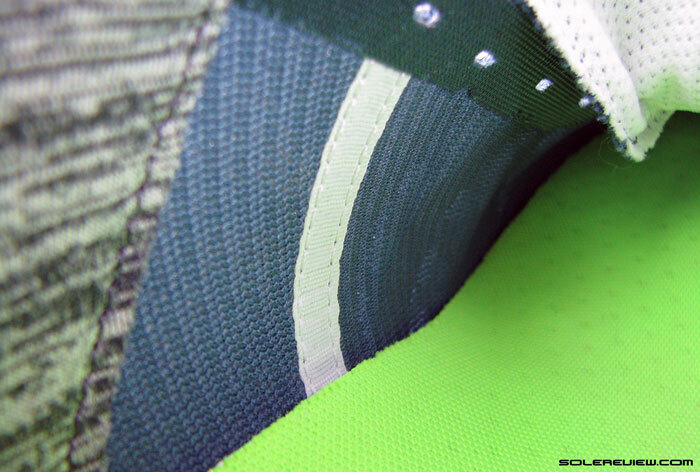 Midfoot panel area is reinforced with the N logo overlay. The large tongue loop helps prevent tongue slide. Laces are of a flat, semi-stretch type. Midfoot is beefed up by double layering of fused panels. A set of triangular panels wraps up medially and laterally, and ‘N’ side logos add form and structure. These are completely integrated with the upper, so again, no feel of higher cinch pressure. Tongue has no sleeve, but slide is not an issue and it sits well on the foot. The tongue is stitched only to the front, with no gusset unlike the Zante. However the narrow lacing and the center loop keeps the tongue locked down, and away from lateral slide. The heel has an internal stiffener/counter. Achilles area is soft and chafe free. Heel area looks like it is collapsible, but no, it isn’t. It hides a medium sized internal stiffener, even larger than the Zante’s. It is of a non-interfering nature, with its stiff walls stopping well short of the collar edges. 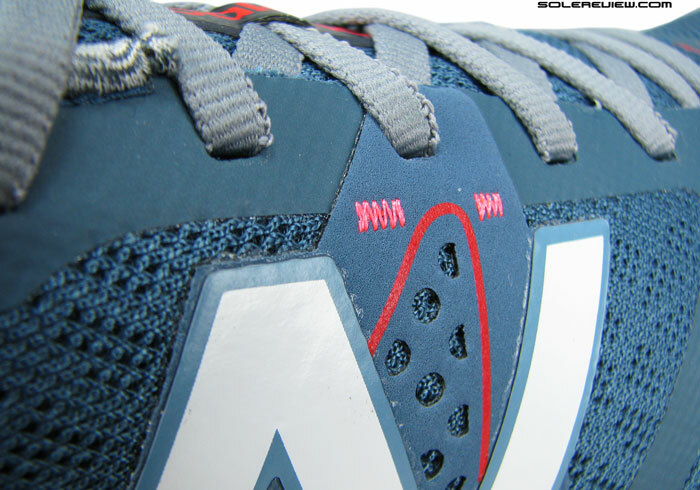 The portion which goes around the Achilles is free of overlays, making it conform to the foot without rubbing. Neat looking collar area with a melange-slub like design. Slightly padded, with a soft wrap. No slippage. 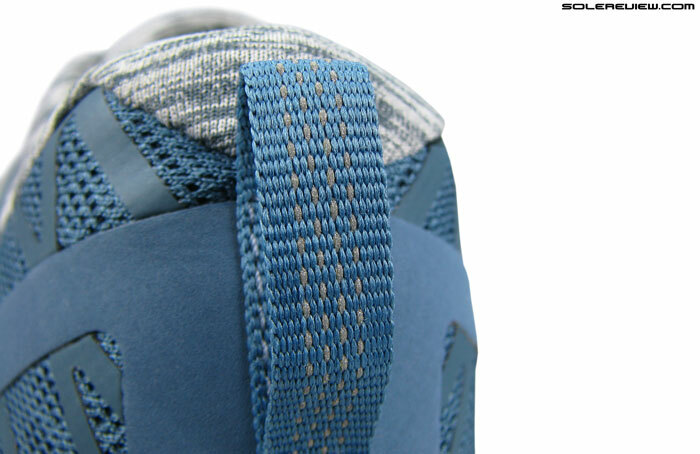 Heel pull tab is a woven strap with built-in reflectivity. The toe bumper has a reflective strip to light things up at night. The collar is soft to the touch, coupled with a little padding and a cotton slub like design, which is a nice element of detail. It provides the right amount of grip, in line with the overall ethos of the 1500 v1. 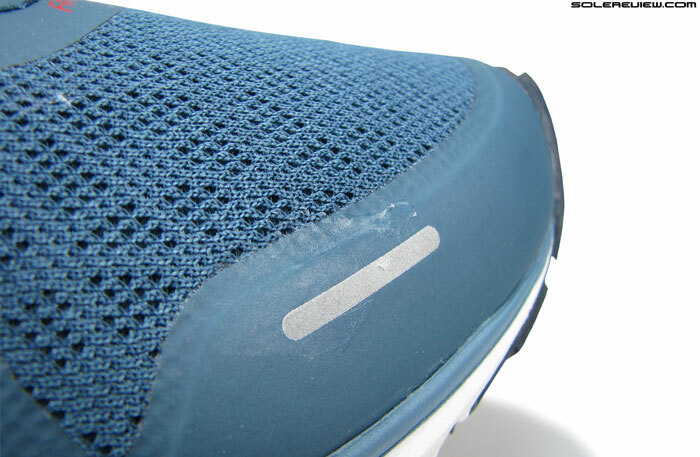 Reflectivity is another area not ignored; a small strip lies welded on lateral toe box, and the heel has a pull tab with shiny elements woven into it. The running shoe market is crammed with examples of mediocrity, and the 1500 v1 refreshingly rises far above the noise. It’s great for short and long runs alike. Slow or fast. Great ride and upper fit. It shines on track or road. Doesn’t break your bank balance. Comes in D and 2E widths. The $110 lightweight brings together all the right ingredients which make a shoe great, and New Balance seems to be doing a lot of that lately. And we have a feeling there’s a lot more of that coming over the next few months. Tester note: While the NB1500 v1 has one of the highest scores on solereview, please understand that it is contextual – meaning that the 1500 V1 gets the score within its category (lightweight, supportive pace shoe), and should not be compared – scorewise – to other cushioned trainers. Please feel free to ask questions in the comments section below. Noted the absence of the scorecard. Deliberate? Excellent review as always! Cheers! Got it! I guess I was here too early! Great review! I own both the 1400v1 and 1400v2 and they are fantastic! These seem to be awesome also, are they worth a go for a neutral runner? Sure, if you don’t mind the sensation of firmer medial post beneath. But is it still a Neutral shoe or is it more Motion Control? hi I’m looking for recommendation stability shoe that isn’t not too bulky, fast feeling, not too squishy, very durable and very stable thank you love your site. The 1500 V1 might be up your alley, as well as the adidas Tempo 7 Boost. How would it compare to the Pegasus 28 and 29 versions or the early Nike vomero series? This is a much more lighter shoe, more speed focused, so very different from either the Pegasus or Vomero. Also has a medial post, so you’ll not get the neutral behavior of the shoes you mentioned. If you’re looking for a cushioned trainer, would recommend that you wait for the Vomero 10 to hit mass retail. Haven’t got our hands on the V10, but looks promising. I see you will be reviewing the Vomero 10 in the near future. Do you the release date for the Vomero 10? The Vomero 10 has already started reaching warehouses (roadrunnersports is already selling it), but we think the official release date to be around mid April. Speaking of cushioned trainers, the Gel Nimbus 17 is very soft to run in. The fit is very similar, you’re correct, with the 1500 v1 having a even ‘spread’ of fit. You’re also correct in assuming that the 1500 has a more focused, race oriented design. The Zante has more volume of foam underneath the heel and forefoot, with a greater sense of splaying. Harder side of the 1500 v1 medial midsole is very noticeable, especially when you’re coming from a Zante. That said, we don’t know the loading specifics of your gait pattern, so can’t say whether you’ll mind the sensation (or not). The best way to find out is to try them on, much better if you can manage a short treadmill workout at the local running store. If you’re looking for a firm tempo shoe, the adidas Tempo 7 Boost is something you can try. But the fit is very different from the Zante/1500 and the ride too, so again, you need to take the final call. Ok, Thanks! Sounds a bit like the Saucony Fastwitch, where i found the harder medial midsole is more noticeable too. I guess i´ll just give the NB 1500 a try ! In my opinion, New Balance has got a strong momentum right now, really good shoes. Yes, no substitute for trying the shoe. You can then overlay your own opinion over our review/feedback. We also think that NB is killing it right now! Hi guys, thanks for the review! I suppose that the 1500’s toebox is a bit snugger than the Zante’s, right? Only very slightly snugger, minor difference here and there. Also Zante’s forefoot goes from relaxed to snug the moment there’s some pressure on the first row of semi-independent lacing. A 94!!! There’s no way that I’m going to be able to stay away from these for long. At least if I hold off until my race schedule picks up I can justify it that way. So nice to see some love shown to the non-neutral folks in this category. Two questions for you all, though. First, does the 1500 run perceptively narrower than, say, the 1260? I’ve seen some reports of that and am curious whether I may need a 2E here. I obviously have to try on myself, but curious to hear your thoughts. Second, where are you all based out of? I assume somewhere East of the Atlantic, given how early some of these reviews seem to show up where I am on the U.S. east coast. These shoes have very little flaws – near perfect if one knows what to expect. We feel that the 1500 is only slightly snugger in the forefoot vs. a 1260. But having said that, the 1500’s midfoot feels snugger than the 1260 and the toe box feels a wee bit pointy. Solereview’s resources are distributed all over the place. But we tend to buy most of our shoes online, with special preference to runningwarehouse. The best thing about them is that they don’t charge state sales tax. When you’re spending $1000 per month, then 10% counts for lot. They get a lot of new models in pretty early, so that’s a bonus too. I don’t see a lot of 90%+ shoes with good arch support like this one. Any other 90%+ ones you have reviewed that have even better arch support? The UA Speedform Gemini comes to mind – though there are no medial ‘stability’ elements there. Hi,First of all,thanks for the review..
Now ı am using lunarglide 5 for training and racing. (ı am racing at ıronman and marathon races)I am quite happy with them but have some issues like nail loss..I am a heel-midfoot striker and ı want to use my midfoot more effective..So ı want to use a shoe wich is lighter and with a lesser drop.I am interested in NB zante and 1500 v1.,asics gel hyperspeed 6 ,asicsds racer 10 and saucony fastswich 6..My question is:Do ı have to buy a single shoe(ex. :NB 1500 v1) for training and racing or do ı have to buy two different shoes for trainingand racing? Not a bad idea to combine both needs when looking for a shoe. For example, the comfortable Zante is something you can both train and race in. It is fairly durable too, we’ve had that shoe for a while now. The NB 1500 can do the same thing, but you have to be ok with the medial post and the slightly lesser outsole durability. Being a slight overpronator medial post will not be a problem. ı am really uncertain between zante,1500 v1 and m 890 v4 ..Their price are nearly same ,the heel area is stiffer in 1500 v1..Durability commentsara nearly identical.The upper of the 1500 v1 is more like a sock,ı understand..It is a hard decision..Can you tell me any other suggestions?Thanks for reply..
We’d go with the NB 1500 V1. Thanks for your help..I ll write the conclusion after ı use it a while..
Hi,today was my first day with 1500 v1..My normal long day pace 5:15-5:30/km..Since this was my first day ı wanted to be slower because i was using lunarglide 5 with 11 mm drop and diddnt want to hurt my achilles.But when ı started running it was awsome,ı could not go slower:)..Transition was very soft and easy ,The shoe is very light .my cadance was araund 88 rpm and pace araund 4:50/km.My heart rate was the same with the 5:10/km with lunarglide 5.So it solved the issue of power loss due to poor technique.Had a 20 km in 1:36:00..with 4:49 pace and no achille or knee pain.The front part is a little bit roomy for me but ı can put an extra sole to front part after the insole is pressed after 100 km.As a conclusion this is the best shoe ı have ever worn.Thank you again for your review and help.. Thank you for sharing the excellent feedback, and happy to hear that it performs so well for you! Hi. I’m currently using the Structure 18 for everyday runs. I like them but need something more light weight for racing. I supinate and have wide flat feet with a forefoot strike. Think these would do the job?? Thanks for the great review. These are great shoes, but we feel you’ll need a 2E in them. We blasted the adidas Tempo 7 in our review, but if the quality is right, that shoe is also worth a fit trial. almost transcends common sense… Great site btw, best reviews I’ve found online. Honestly, we have no idea what will work (for sure) in your case. When it comes to PF, one should treat your feet with kid gloves lest it flares up again. Even if a shoe makes sense on paper, it might not when put to use. But having said that, here’s our opinion, and you can take it for whatever you think it is worth. The medial post in 1500 v1 is noticeable, and hence might react in a way unfavorable to medial Plantar Fascia. Actually most lightweights (motion control or not) have a narrow midsole waist, so again, whether the midsole rims put pressure on medial PF is something one will find out after a few weeks or so. In your place, we’d buy something like the Supernova Sequence 7 Boost or the Glide 6 Boost (if you need something more cushioned), both of which are lighter than the Nimbus 15, 16, 17. Thanks very much for the advice, a lot to ponder! So was I wrong to think that pressure on the medial plantar would be a favorable thing then? I only figured that would be the case as all of the supportive insoles tend to be quite solid under the medial arch, or is the issue that the thin nature of the shoes places that pressure in too narrow an area, rather than across the whole width of the arch? Yeah I’ve had it flare up twice, though the second time was my own fault for pushing myself too fast while it was still niggling. Don’t want that to happen again so ‘kid gloves’ is the correct term – including me being very paranoid about what i put on my feet! My nimbus 15’s recently fell apart around the heel but Asics replaced them with the 17s (you might be interested to know they told me that the reason they got rid of the ‘PHF’ feature in the 16 was because of issues with it wearing down – amazing customer service, mind), but I’m taking things very slow as they feel completely different. I’m eagerly awaiting your review of them to see what you think! Pressure on medial PF and its effects depends on a case to case basis. Like you pointed out, a replacement insole is more often than not, anatomically matched to the foot, including the arch. This differs from narrow waisted trainers, which tends to exert pressure along a narrower/sharper ridge. Yes, the Nimbus 17 is very, very different from what the model used to be. Thought we could finish it by midnight PST, but will take a few more hours. Very high number of images in the review, along with the additional match scorecard which accompanies reviews where a comparison with the previous version is made. And of course, checking for grammar errors and typos, which is a task in itself. Interesting – I didn’t consider that the width of the shoe would make a difference but that does make sense. I only started getting pfs after switching to the cumulus 14, which I absolutely hated precisely because of how narrow they made it on the waist. Thanks for the insight, if you need any help proofreading then I’d be glad to offer my services! Piping in with a slightly question on narrow-waisted lightweights. If one with PF or other maladies (for instance, my low arches tend to bark loudly if the fit isn’t spot on in the midfoot) wanted a lightweight, mildly supportive race/uptempo shoe, might simply going wider (to a 2E) remedy the problem provided that it doesn’t ruin the rest of the upper fit? These kind of things tend to be very subjective. 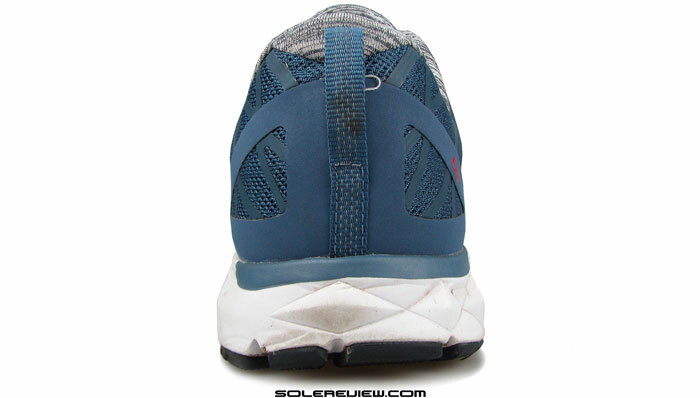 Going 2E will widen the upper (mostly forefoot, slightly midfoot) but nothing changes on the midsole. That might raise another set of variables, favorable or otherwise. Hi there! Really great reviews. Just wondering if you’ve done a review of the Brooks Racer ST5? Seems to me that this shoe would fall into the same category as those mentioned in this review. We haven’t reviewed the shoe, but might do so in the near future. Thanks for the suggestion! I’d be interested if anyone has ran a marathon in these. Not sure whether to run in my trusted Brooks GTS 14’s, or something lighter such as this…. Steve, I’m going to in two weeks. I train in the purecadence/mirage, and race anything shorter than a marathon in flats. I used the 1500’s for a 20mile with the last ten @ marathon pace (7:05) and they were fine, so I think I’m good to go. If you’re used to a lower heel/toe drop and running in less shoe, these will be fine; if you only run in the GTS you’d need a lengthy transition period before considering these for a marathon. You could consider running a marathon in the asics ds trainer or the saucony mirage, which would be a little more shoe than the 1500 but still a heckuva lot lighter than your adrenalines. Hi guys and thanks for the review! I think that this one was spot on, I wouldn’t change a word from your feedback. Awesome upper, no hot spots and a fit appropriate to use them for both training and racing. To my liking, the midsole tuning is just perfect, very responsive but in a forgiving way. I feel that I could use them for intervals (not 400m maybe), as well as long runs. Does the medial post bother me? No! Would I prefer it not being there? Yes! Also, the assembly quality is exceptional! I already run in the 1400 (V1&V2). It’s not comparable to the 1500, whilst its weight is relatively close. It’s a pure racing flat. Another comment on these two shoes: 1500 is 1mm thicker at the forefoot but 2mm thinner at the heel. However, it is much more cushioned and protective than the 1400! Αlso, they share exactly the same insole, although they are built on different lasts. Interesting – thanks! Will keep your feedback in mind when we review that shoe sometime in the near future. Other shoes like the 1500v1 (and adidas tempo, albeit a little more shoe) are the saucony fastwitch and asics ds racer. Brooks ST racer is similar too but a bit more shoe (1 ounce) and with a much higher heel toe drop. I had all of the shoes you mentioned in my rotation and only the Fastwitch is similar to the 1500. DS is a pure racing flat, quite firm and with a very discreet medial post. ST5 is (and feels) much heavier and bulkier. Thank you for the comparative perspective – hope to get those reviews wrapped up in a few months and see how they stack up against the 1500. HI, great review and these look like a real good show to try out, unfortunately i am bound to internet buying for trainers so I was wondering how do they compare size wise compared to mizuno? I run in Saynara 2’s and Inspires size Euro45 and that’s perfect for me with toebox fit, would the NB’s be the same or would I need to size up as you mention they are narrow at the toe? thank you and keep the great reviews coming. The Sayonara 2’s fit is a little more relaxed in the forefoot compared to the 1500 v1. As far as the area around the big toe is concerned, both feel similar. The difference is around the medial toe box (space over the smaller toes), where the 1500 V1 runs a bit crunchy on space because of its relatively pointy front profile. But we won’t advise you to size up, regardless. “medial toe box”…. i think u meant lateral toe box, where the smaller toes live. Thanks, and corrected. But you gotta cut us some slack, we reply to around 50 questions a day! Great review. Been running in the 1500 for a few weeks now and very happy with them for my short and medium runs. Still not sure that I want to do a lot of long runs in them. Any recommendations for a shoe that would be a good complement to the 1500 for longer runs? The Zante and Boracay are great options to consider. Hi I’ve recently found your site and the reviews are amazing. Great job, well done. Like other people I would like to ask a question. I am currently running in the purecadence 3 but I am looking for a light weight (sub 220grams if poss) performance/race shoe with a slight amount of support for pronation and it’s seems the main runners are the saucony fastwitch 7 or the new balance 1500v1. Would you recommend one over the other or are you aware of another shoe which I haven’t considered yet. 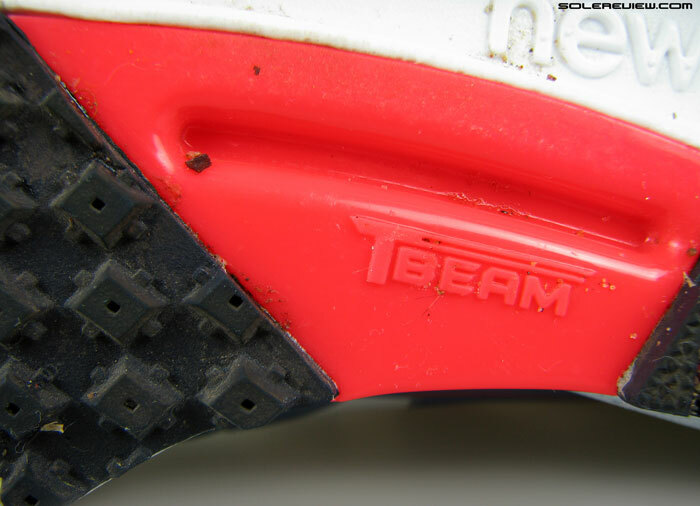 I am concerned about the transition of the ride with a large block of plastic in the midsole. I have run a lot of miles in Fastwitch 5 & 6. 1500 is definitely a superior shoe. Thanks for your feedback. With many others shoes on the market (many of which my local shops don’t stock)I have to resort to the internet for advice. Have you run in the asics gel ds racer? I’m looking for a quick half marathon race shoe or is the new balance 1500v1 the best out there at the moment. Same story here… I am Greek and only the “popular” models are imported here, so I have to order online from abroad. DS Racer is a pure racing flat. Quite firm cushioning, snug fit and minimal weight. Pure Cadence is a soft shoe (I ‘ve run in all of its versions) and maybe the DS is two steps down for you. After 60K in the 1500s, I am still impressed every time I run in them! Won’t be able to add anything more than what Nikos has said below, as we don’t have testing experience on the Fastwitch. From a standalone perspective, the 1500 appears to meet your needs. We also like the Mizuno Wave Hitogami 2, and while it does not have any pronation control features, it is supportive. It is not sub-200 grams, but then you did not mention what size you wear. That makes a difference on the weight. Can’t find a review of the wave hitogami 2 on this site. How does it compare to the 1500v1. The Hitogami 2 review will be up sometime this month. It is firmer and slightly snugger in the forefoot than the 1500 V1. Hi I’ve been running with Nike Zoom Streak 5 based on your recommendation half a year ago on several half marathons and 10k’s. They’re great as I like the light weight. Now I’m training for marathon and some trek runs with climbs, I feel the Streak 5 isn’t giving me enough cushioning after the 25k mark in a long run (I might be wrong). After reading your review on the NB 1500v1, I was tempted to try them on and ordered a pair. Just wanna double check with you would this be a good substitute to my Streak 5? Or do you have any other recommendations? Thanks! 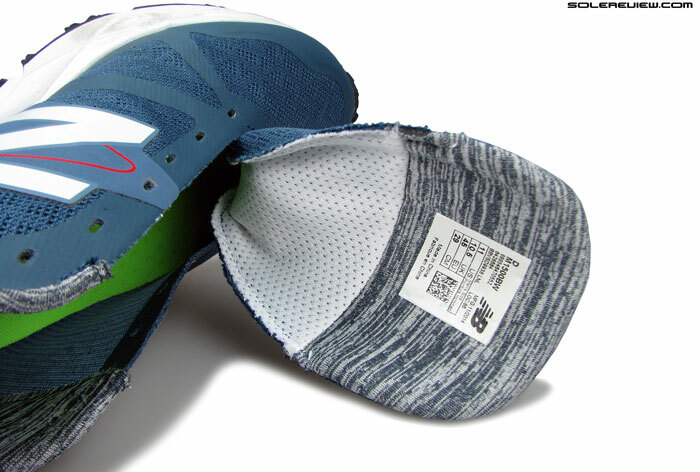 The NB 1500 definitely feels more cushioned than the Streak, but you should be comfortable with the medial post. That’s the only thing you should be mindful of. Otherwise the Fresh Foam Zante is a no brainer when it comes to combining cushioning with low weight. Thanks for the reply. I also came across the new Adidas takumi ren boost. Is that any good? Not sure how either the Takumi Ren or Sen Boost fares, no miles on them. Have tentative plans to review either one of them. Tried a pair in early January, great shoe! Once again thanks for the great reviews. I am currently running in Cumulus 16s which are soft, but I would like something lighter & quicker for the summer. I am a neutral foot, 80kg, running usually 7-15km road sessions 3/4 times a week. I was wondering if the 1500v1 will be too much of a change for me? Is the motion control shoe ok to use for a neutral runner? If you don’t recommend the 1500s for me, What other shoes would you recomend from Nike, Asics or Adidas? i saw the new Climachill Gazelle Boost but the thin sole scared me off (like the new ultra boosts)…. also Lunar Tempo looks nice. Your feedback would be valued!! The 1500 V1 is quite different from the Cumulus 16, but fits your requirement of fast+light. The medial post isn’t so much of a bother, so yes, it works as a neutral shoe too. Yes, the Nike Lunar Tempo is great (super light and feels fast), and you could try the firmer adidas Boston Boost too. Don’t have enough review experience with faster Asics models, so can’t offer any recommendations there. I’ve gotten really into my running lately and subsequently have spent hours researching shoes. I’ve been running in some Kayano’s (got a pair of 18’s and 19’s) and after doing some reading, recently bought a pair of DS Trainer 20’s which I quite like. 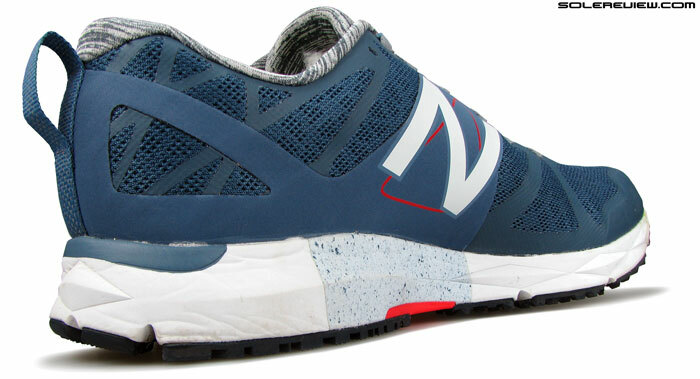 Then I found this and feel I have to give the NB 1500v1 a try! Quick question – My Kayano’s are a size 12.5 and DS Trainers are a size 13 (impossible to get a 12.5 in Australia) but fit reasonably well. I think I’ve sourced a size 12.5 in these online, would the fit be fairly similar to a pair of Kayano’s? The Kayano 19 has a little more room ahead of the big toe, and is more relaxed on the lateral (small toe) side than the 1500v1. But we won’t advise changing sizes – the 1500 V1 is a semi-racer, hence the slightly tapered fit. Thank you for this amazing review. I was looking for a good shoe for track workouts and shorter races. With a history of some knee issues, I wanted something that gave me a little more support and padding than a true running flat, but inspired more speed than my more all purpose running shoes. These seemed to fit the bill – and they do. When I put them on, I want to start moving. When I start walking, I want to jog. When I start jogging, I find that I’m running hard. I will wear them for 5ks and 10ks for sure. I have not tried any longer runs yet, so will wait to decide if they are right for me for distances over 6 or so miles. Appreciate the detailed feedback! These do ok for longer distances too. Yes, this shoe is stable enough, but it has a narrower base compared to the 1260. Fit try them and see if there are areas which can potentially be uncomfortable – like the midsole edges. Hi, I’m hoping you can help narrow down my choices a bit! I mostly run races between 10-16k, with the occasional 21k. Varied surfaces. I’m a tall/skinny guy, with narrow/skinny feet. Treadmill-test said I need mild support. For the third pair I found your incredibly in dept reviews! However, I can’t decide which of the ‘motion control’ shoes are better suited for me… NB 1500v1, NB 1260v4, Adidas 7 Boost, Nike Lunarglide 6, Saucony Hurricane, etc. etc. It would seem that shoes with narrow upper forefoot aren’t your type. Assuming that you keep a thumb’s width of space in front. As regards the heel blister from the GT, can’t say what the exact cause might be. This rules out some of the tighter fitting shoes such as the single width NB 1500 V1 and adidas Supernova Sequence 7. The Lunarglide 6 is a one-width model (unless you go ID), but forefoot room can be created by loosening the Flywire cords. But it has a hard heel counter, so fit try and see if you can draw similarities with the Asics GT-2000’s heel. Widths are available in the otherwise snug 1260 and Hurricane, but in our opinion, they seem too much of a shoe for being a racer. Have you considered the Mizuno Wave Inspire 11? Fits the ‘mild support’ description, reasonably lightweight. roomy forefoot, and if you can get used to the firm ride, then it is actually a good shoe. I typically do speedier workouts in Mizuno Sayonara. While it is a fairly low weight shoe, I am looking for something a tad speedier for race day. Do you think this would be a comparable shoe to the sayonara and what distance races would this shoe be good for? Think of the Hitogami as a watered down (in cushioning) version of the Sayonara 2. Much firmer, and hence feels much speedier. Our personal take on the Hitogami is that we find it suitable for no longer than 20k runs, as the sole is pretty firm. We’d prefer something a little more cushioned like the adios Boost, GoMeb or the Zoom Streak (or even the Zante) for going longer (say a full 26 miles). How are these if I want to start training for a half marathon (pretty slow pace)? I’m deciding between these, Nike Elite 7, and Energy Boost 2.0? I currently train in the Peg 31s, and I like them, but they are a little ‘big.’ In the past I had the Flyknit Lunar 2s, which were awesome, but got worn out very quickly (too quickly) and I could feel the lack of cushioning 70 miles in or so. Thanks. We’d choose the Energy Boost 2. Fits tighter than the Pegasus 31, and the cushioning’s rad – more comfortable than the Elite 7. Thanks for the reply. A quick follow on question. It seems there are a few different boost models; the sequence 7, the glide 7, the sonic boost, and the regular energy boost. Can you provide some insight into which one you think is ‘better’ for me? I have some knee problems so a bit of cushioning helps. Thanks again so much. What a great review! Really excited about this shoe. I’ve really flat and narrow feet. Right now the Wave Inspire is doing the trick, but something even with a lower stack height would be ideal for faster races (I’m not crazy fast, but I feel like bulky stability shoes make for clunky fast strides, sometimes). So, the question is, is this a good transition from the Inspire? Thanks so much! Thanks! It is certainly a good shoe to rotate alongside the Inspire if you can make it work. Nicely padded, and has a focused feel to it. Great fit too. You recommend it for neutral runners. Can it cause injuries? You need to be more specific. Why do you think the shoe could cause injuries? I don’t know if the medial post is more indicated for a pronator runner and if it can correct, in the wrong way, the natural movement of the foot with a neutral pronation (not overpronated runners). Injuries are caused more by a standalone instance, or combination of poor running form, surface, and level of muscular conditioning/strengthening. Anyway which, the medial post of the 1500 is so small, it is more of a visual placebo than anything else. The whole pronation vs. appropriate shoe thing is over simplified and generalized. The product segmentation we have today is a residue of over-interpreting 70’s biomechanics research. Studies on whether such shoes prevent injuries has yield nothing conclusive, all is pretty vague. So is the whole heel vs. forefoot striking debate. HI, I bougth the 1500v1 one week ago and are a GREAT shoes. I am very happy. Very good grip (out of road too! ), extremely well cushioned if you think its weight is only 200 gr. (7 oz) and with a drop of 6mm. The medialpost as you said is not intrusive for a neutral runner. Thanks! I like it a little more than the Adios Boost, the upper (fantom fit) of the NB is amazing. Thank you for the feedback Eduardo, and glad to hear the 1500 suits your needs! Interesting. So, is going the route of “choosing the most comfortable pair of shoes and go run” the right way to approach the issue? Yes, at least that’s we think, after reviewing 100+ shoes. We used to subscribe to conventional wisdom (pronation/arch vs shoes) earlier, though. The definition of narrow would depend from person to person, so it would be helpful to know which shoes have you liked in the past (with snug collar fit)? Runner’s World magazine’s review of shoes sometimes indicate if a shoe is generally snug compared to other similar shoes. The shoes in my past were somewhat snug in the heel area but not anymore. Could you offer a comparison to other shoes in this category? Or recommend any other shoe that tends to be with a snug collar fit? If you really want a snap-fit kind of collar, the 2015 Nike Free 3.0 Flyknit is the shoe to buy. Or the 2014 Nike Free 4.0 Flyknit. Reading your great review from Ireland. I’m looking to buy another pair of supportive lightweight racers for my assault on the Frankfurt marathon later this year. I’m currently using the Brooks ST5 but they are just about finished! How would you compare the 1500 to them? Also I’m wondering if these would be suitable for marathon distance? We haven’t had a go in the ST5 yet, so don’t know how these compare. As far as marathon compatibility is concerned, these do well for 26.2’s – enough cushioning to go, in a lightweight package. Thx fellas! Hopefully you’ll get a few in in the ST5 soon! Yes, hope so. Huge review backlog right now. How would this compare to the Saucony Kinvara 5? Can I run marathon with this shoes??? Depends on what you’re used to. Some people might find this too less of a shoe, while others will find the 1500 up to the task. I have run marathon twice with NB 1400. I need something more stability than 1400. What do you think? 1500 or Zante is better? In that case, you will be ok with running a 26.2 in the 1500 v1. Go for the 1500 instead of the Zante. Does this shoe have enough support/stability for a somewhat heavier runner that over pronates? (225lb man) or would I be better off with the Brooks Transcend? Thanks in advance. No, for daily use, you’re better off with the Transcend or Beast 14. The 1500 is a lightweight, tempo shoe. Would these shoes be good for Tough Mudder? It’s about 18k of trail running and constantly going underwater and through heavy mud, would these hold up? If not, what shoes might be? No, in their stock form, these won’t make the grade. We’ve seen a picture of an ultra-athlete trail running in these somewhere (forgot who), but that shoe was heavily modified. Don’t have any suggestions for you though, sorry. Currently, our testing is limited to road running shoes only. I know of one trail runner who runs single track on mountainous terrain in these shoes. Usually around 20-25k and at fast paces (less than 4:00/km). The main thing you want for tough mudder is a shoe that doesn’t retain water so think about tri shoes. I’m looking for something to replace my Nike Free4 Flyknit after the two flyknit halves started coming apart. Deciding between the 1500’s, 2015 Free 4 Flyknit and Asics Zaraca 3. How about switching gears a bit and buy the Nike LunarTempo? Supremely lightweight, and pretty awesome for those intervals. Even the 1500 work well for intervals too. I am a collegiate runner running 75-85 mpw, and I’m looking for a trainer to do some longer road tempos. I currently do most of my mileage in Nike Structures, New Balance 890s, and Asics DS trainers (fairly different shoes, I know). I’m a 5-9, 140 pound runner with at 5k pr in the 14:50s. For my long tempo shoe, I’m considering the NB 1500, the NB 1400, and the Mizuno Wave Hitogami 2. Having stability elements isn’t crucial to me, but I want there to be enough shoe for regular 8-12 mile efforts. Which shoe would you recommend for me? We’d narrow the list down to three shoes in order of preference – the Nike LunarTempo, the NB 1500 v1 and the adidas Boston Boost. We’ve heard great things about the 1400, but can’t offer a wear-tested opinion because we haven’t reviewed those. Hi! Just found this site and have been devouring these in-depth reviews, so thank you for putting so much good work into them. Here’s my situation: I’ve been using 2012 Brooks Pureconnects for the last 2.5 years and an upgraded is way overdue. But to be fair, when I bought them, I got them for their minimalism, so I didn’t think running in them forever would matter since it was all trending toward the barefoot movement. Also, I tend to run on the balls and the outer edge of my feet. But here’s the deal, I have super flat feet that pronate when I walk but not so much when I run since I had PT in high school to correct my feet positioning for track. I’ve been to a few shoe stores lately to find a new shoe and they have all kind of freaked out about how flat my feet are and the pronation and suggest I get some super stability shoes. I’ve never worn stability shoes because they always seemed clunky and really heavy. I’m really captivated by the NB 1500 and also looking at the Asics Gel-Kayano 21s (possibly both). Do you think those would be good for me? The NB 1500s seem really awesome. 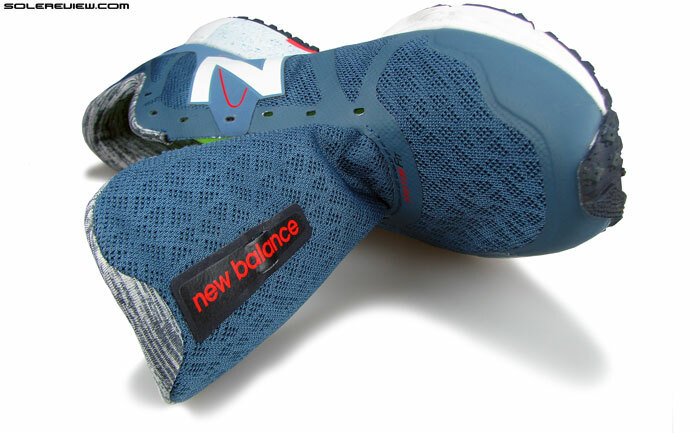 The NB 1500 V1’s feel awesome on track and road, and even has cushioning to go. The other shoe you can look at is the slightly more cushioned (and 15% lighter) Nike Lunar Tempo. Kayano is a very soft shoe, and if you’re used to Pureconnects, the Asics will feel like a slug. Hi, Im using my Adidas Supernova Sequence 7 Boost as an every day trainer, running between 6-10 miles. Im in love with the boost technology. Im Moderate Level of Over-Pronation. Before my Adidas, I was running in my Mizuno wave inspire 9 for 2 years (I got 4 pairs in 2 years). A month ago I have changed my foot strike technique from heel to middle strike. My question is, How this 1500 v1 New Balance compare with my Adidas and the Mizuno’s? Do you think I need to give a try to the NB 1500 v1? thanks! the 1500 V1 is a much more minimal shoe than the Sequence and the Inspire (don’t have experience with the 9, our answer is based on 11). The 1500 is a shoe you should go for in case you feel either the Sequence or Inspire feel bulky and slowing you down. On the other hand, since both the Sequence and Inspire have a broader and firm midsole, they feel more supportive – a feeling you won’t get in the 1500. I normally run about 10-15 miles a week (anywhere from 3 to 10 miles per day now) and I’ve started to feel pain on the side of my left foot right above the arch area on the longer runs (8 or 10 miles). Do you think I would need a shoe with better cushioning (looking into the GT-1000 3) or is it just a result of ramping up too quickly? Your rapid increase in mileage could be the reason, yes. But to be sure, a visit to the physio/podiatrist is recommended. Shoes only play a small part in soreness, unless the shoe is an example of extreme minimalism, super soft ride or unconventional midsole design. Hi, you’ve caught my attention with this review. I’m currently running in Brooks PureCadence 4s (having gone through the a pair of PureCadence 3s already). I feel I would like a bit more cushioning in my next shoe whilst still retaining some light stablity features. 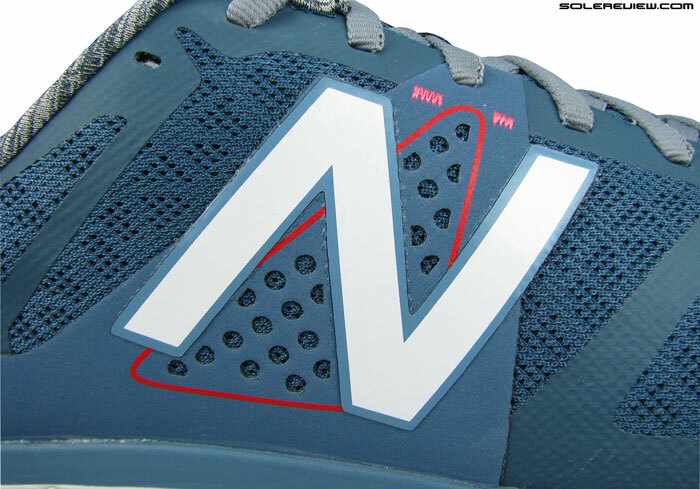 Is the NB M1500v1 an option? You won’t find the 1500 V1 to be a significant upgrade on cushioning vs. a PC4. How about the adidas Boston or Tempo Boost? Hi, I’m looking for a solid marathon shoe for a quicker pace. I’ve found that over time with fatigue I start to roll in a little in my foot placement. I’m a mid to forefoot runner, more mid foot as I tire. I’ve bee researching the 1500 and the Skechers GoMeb 3. Which would you suggest? I love the Zante but they aren’t enough day in and day out. I have the Go Run 3s which I thought rocked at first but they wore down quickly. Any suggestions? Thanks! Out of the two, we’d suggest the 1500 V1. If you need more durability and a bit more cushioning, then the adidas Boston Boost 5. Thanks for the input! I ordered the 1500s and the GoMebs, but I plan to send them back and try the 1500s in an upcoming 10k. Would love to hear some feedback, it would help other readers! The Brooks Beast 14 is a monster of a shoe, but isn’t an overkill functionally. If they fit well (try and buy a 2E-4E, because the standard fit is tight) and ride well, then it is a great shoe. The NB1500 V1 will be ’too less’ of a shoe. Not sure about 990 or 928, haven’t tried them. We highly recommend that you see a physio/podiatrist to diagnose the root cause/symptoms accurately- we refrain from suggesting shoes in cases of injuries. Hope you understand – we are not qualified medical professionals. the doctor said I moderately over pronate, am heavy (211 lbs 5’11) and need decent arch support, stability and Cushing shoes. Nothing serious. Hence I was on your website and asking for advice. so please share your thoughts on my question. Someone also recommended Kayano 22. For walking, you could try the Kayano 21/22, for running the Brooks Beast 14/Transcend 1, and you could use either the Kayano and Transcend for work. We don’t have review experience with the Women’s versions of road running shoes, but based on our wear tests of Men’s model, here are some recommendations. Narrow upper, plus suited for faster runs. Hello. Absolutely love the website and truly appreciate the in depth reviews provided. I was wondering if you could perhaps review the Brooks ST5 racer? Same “category” as the New Balance? There does not seem to be any thorough review for it. Not sure why? Also, what about Under Armour shoes? Thanks in advance for the consideration. Our choice of footwear is influenced by our budget, or rather the lack of it. Since we buy almost all our shoes for our reviews, we have to prioritise and stick to more popular models and brands – though we would love to expand our range given the opportunity. We do have UnderArmour reviews, like the Speedform Apollo and Gemini. Please use our search function or the list of reviews page to locate them. Quick question. From a sizing perspective is the fit the same as the NB Boracay. The 1500 runs slightly smaller, but we don’t think a half upsize is necessary. But no substitute for trying both the shoes on yourself and deciding! Just ordered a pair of these (the yellow ones!) on the strength of your review. Can’t wait to try them out. I’ve a marathon two weeks from this Sunday and they may just be the shoes I use for it. Depending on how they break in of course! Would love to hear your feedback once you’ve had a go in them! I’ve done two runs in these. One 40 min tempo which was the maiden voyage and a 17 mile long run. So far things are good. They fit like a glove. I’ve never worn an almost seamless pair of shoes before and I was wondering about the level of upper support. I needn’t have worried. The wrap around the foot was great. I was impressed also with the cushioning for such a light shoe. I had no problems during or after the 17 mile run. This was an important run for me as it was the last really long one until my target marathon in Frankfurt on the 25th of this month, just under two weeks away. They seem plenty of shoe for the marathon distance and at this stage I reckon they will be my race day shoes. I do wonder if just over two weeks is enough time to get used to a shoe for such a big race. They feel so comfortable already but 17 miles will be the longest distance I do in them before Frankfurt. Ideally I’d have liked to clock up at least a 20 miler in them. There is quite an amount of wear evident on the sole already but I suppose these are not going to be my regular training shoes. The indestructible sequence boosts will fill that role! The ones I got are a mad yellow! I’ll be easily spotted anyway! Appreciate for coming back with a detailed feedback! Glad to hear all’s good with you and the 1500 V1. Though we think that if you went 17 miles without any issues, a 26.2 should be ok. Yes, the outsole nubs see wear fairly soon, so yes, the Sequence is a good backup. Update! I did the Frankfurt marathon on the 25th of Oct in the 1500s and all I can say is “WOW!” What a shoe! I did think that they suited my foot before taking on the race but am now sure they do. I just can’t get over the combination of fit, cushioning and support in such a light shoe. This was my 7th marathon and my goal was to go sub 3, I clocked 2:54:14 so my opinion might be a bit biased! but I can only go with what my experience was and be as honest as I can. I was a bit worried about the 6mm drop and the effect it might have on my calves in the latter stages of the race but this was not an issue. After each of my previous marathons my feet were in bits. Not after Frankfurt. In fact they were the same as if I’d done an easy 5 miler recovery jog. I would put both these results down to the ample but responsive cushioning. I only have 61 miles on these shoes but already they are one of my two favourites ever along with my trusty Sequence Boosts! (I’ve bought a new pair of these to replace my present ones. First time I haven’t changed brand/model when it came time to do so)You might notice a correlation between your shoe reviews and my shoe choice! You’ve given me a good steer so far! Thanks guys!!! That’s amazing to hear, and your detailed feedback is appreciated so much! Thank you! The 1500 remains one of our highest rated shoes here on solereview. 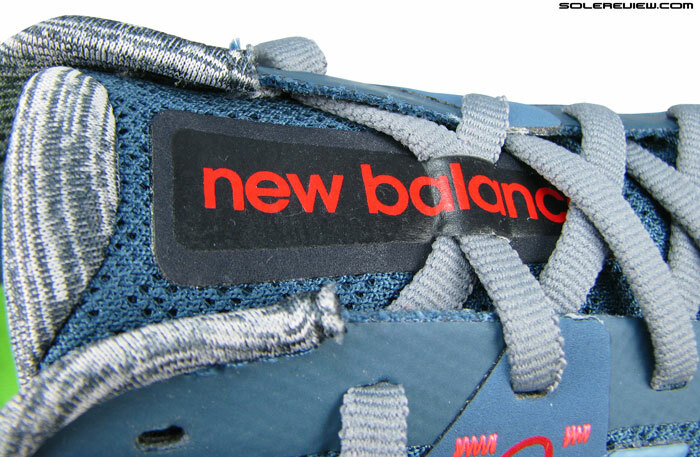 And been reading great things about the NB 1500 V2 too. Bought these last week in the ‘outstanding’ yellow colour because of the 2E width. Had a good run on the treadmill, and another on the road. First impression is very positive, particularly on lightness, fit, transition, responsiveness, ground feel and balance. I was hoping to use it for a marathon, but it might be just short of a perfect marathon shoe because of the 6mm drop (8mm better for me) and amount of cushioning (I am not light or fleet-footed). I would say it’s perfect for racing or face-paced training up to the half-marathon distance. Appreciate the feedback, thank you for sharing! Hi, I want to give my feedback on my 1500v1, now after 200 km of intervals, tempo runs and long runs too (two runs of 34 km and some 28 km runs ). I am positively surprised by the big amount of cushioning (I usually run in Adidas Takumi Ren 2 for half marathons and Adidas Takumi Sen 3 for 10 km races) of this shoe even during long runs and that’s why I will use it on my first Marathon (Firenze Marathon) at the end of november ’15. Thank you for your detailed feedback! The 1500 is one of our favorite shoes, and looking forward to the V2. Great feedback! The 1500v1 has been on my radar for a long time now. After transitioning to low drop/low stack shoes for daily use (Mizuno Universe, Nike LT2, Vivobarefoot), I discovered I need a tad more cushioning, thus a daily trainer that offers just a bit more cushioning with 4-6mm drop (0mm is just too much for my calves when I run 10k+ daily). What’s your experience with the 1500 as a regular trainer? I run 10k per day, and 15-20k once a week. Too little cushioning for this mileage or should it be fine? It should be fine! I use less cushioning shoes for shorter distances and also for daily training use, but when I want/need cushioning and softness 1500v1 is my first choice. Thanks for the awesome review. After I read this and some other positive review I bought the 1500 V1 even though I wasn’t due for new shoes for some time. Now I see the V2’s have been released and I haven’t used my 1500v1’s yet, should I return and exchange for the V2? Can’t say, Devon. We don’t have any miles on the New Balance 1500 V2 yet! Hi, after this review I decided to go with 1500 instead of zante, but the seller said that as I have neutral pronation, I should’t buy these. I should go for zante or 1600. What would be your comment? The 1500 V1 has a tiny medial post. That side feels a bit firm, but most people should do ok. The 1500 has just the right amount of cushioning for 10 k to half – the 1600 will feel too firm, and might not be comfortable as a daily training shoe. Hi, it has been 3 weeks since my purchase; I have ran 75km in them. It was my first low cushion running shoe. The first weeks I wasn’t comfortable at all. Even though it is very light, I felt like I am carrying the shoes like a weight and I could be more comfortable without them. My pace instantly got faster but I wasn’t having a happy run at all. I even considered buying new shoes like Nike Lunar Tempo 2. Then I bought socks with high cushioning and also as I ran more with the shoes, I felt much better. The muscle work in my legs had increased and that started to give me a better feeling. After total of 20-25km with them. I had got used to it and also my legs felt much better, stronger. Now I like the shoe so much that I usually even do my long/easy runs with it. I still use them with tick socks. I ran my longest distance 17km in them and started running much faster, my 10k record is finally under 48mins. Thank for this and all the great reviews, I hope my experience can be helpful to some. Appreciate the feedback – thank you for taking the time out to share it here. This will be helpful to others for sure! Happy to hear that the 1500 has worked so well for you. Hi,i run in Lunarglide 7,can i try NB 1500 v1 or v2 ,whats the main diferrance of this two shoes .Thanks. These are lightweight shoes meant for faster runs till a distance (generally speaking) of a half marathon or so. Lesser cushioning than the LG7, and narrower upper. Would you recommend 1500 v1 for full marathons? I’m a 180cm, 74kg, age 39, 6″ per km pace. I just ran a full marathon with Zante and found it’s too “soft” in last 10km of the race. Generally, we’d peg the 1500 for a half, but it depends on what a runner is comfortable with. If you found the Zante too soft, then perhaps the Vazee Pace might be your shoe. Firm ride throughout. Also noticed the Zante v2 is out would you recommend that? Both the Zante V1 and V2 are similar in terms of ride, so not sure whether it is a better choice over the V1. The Zante V2 has an improved upper, though.